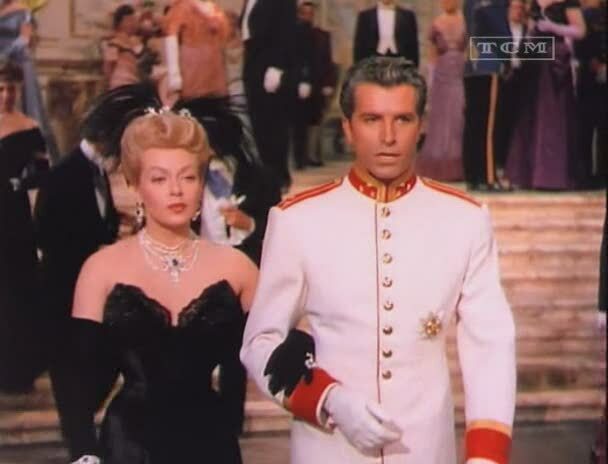 Why spend a fortune on renovating an operetta - starring Lana Turner and Fernando Lamas - and not employ first-rate musical talent for the leads? I agree. They should have gotten actors who could sing better. It's probably my least favorite movie version of the operetta. It's a perfect example of putting star power first and sacrificing authenticity (with dubbing). They also did this again in 1955 when they hired Eleanor Parker to play an opera singer in INTERRUPTED MELODY. She earned an Oscar nomination, because she gave a great dramatic performance. But they dubbed her with the actual singer she was portraying; so there's this jarring contrast between the high-pitched musical numbers and Parker's husky speaking voice. Very unrealistic. They should have just brought someone like Jeanette MacDonald back, or hired Irene Dunne. Where it was more believable that the person we are watching on screen can actually sing. Turner cannot really play the light-heartedness of the material. She tries, but tends toward turgid melodrama. She can't sing, either - although she is given a few lines of sung dialogue. Lamas tries hard and does a lot of singing - is it him? it sounds like him. - but somehow he seems much too "inauthentic". The result - the supporting case takes over and saves the day. Richard Hayden wins out, though, as again one of the great "flamers" of the silver screen. He doesn't hold back - he hits you right in the face. He's stylish and funny and is just what this material needs. Ironically, he was always in demand - reaching his zenith, of course, in "Sitting Pretty" in which he had a field day alongside Clifton Webb. Lamas did sing. He was in a musical with Ethel Merman on Broadway ('Happy Hunting'). And he made a musical film with Rosalind Russell called THE GIRL RUSH. Haydn also was a director. He directed MR. MUSIC at Paramount starring Bing Crosby, plus several other productions. MacDonald was good in the 1934 film and her soprano training really worked out well. I'm surprised they never had Nelson Eddy do a film version as a he was a classically trained lyric baritone. It would have been a perfect role for him. As I said above the film really falls flat without a good baritone like Eddy or maybe Girogio Tozzi (who sang bass in South Pacific but probably could have handled a baritone role in Lustige Witwe ). What kind of a voice did Fernando Lamas have? It sounded - not trained or used? He branched out into directing later. He wanted to be more than just a matinee idol...wanted to prove he was a versatile talent. Perhaps those efforts weren't always successful, but he certainly did try. The young Lana Turner is almost unrecognisable from the later Lana Turner. As she grew older, beauty and glamour seemed to be her primary concerns. If she was capable of giving a performance, there was very little evidence of it. But she did last 18 years at MGM. That kind of success is impressive. As for Fernando Lamas, he was much better in "Rosemarie" with Ann Blyth. Somehow, he did fit into the woodsy atmosphere. I prefer the action films he made at Paramount. JIVARO is particularly good. So is SANGAREE. He also appeared in 20th Century Fox's THE LOST WORLD in 1960. For some reason he worked better in material with outdoor settings. Yes, Esther Williams has said that he was her only male lead who could actually swim. Doesn't surprise me. He seems more athletic than other MGM leading men. There are some good horse riding scenes with him in THE LAW AND THE LADY. He wasn't the world's best actor but he had a sort of dexterity that made his scenes work. What's so winning about him in "The Merry Widow" - a film for which he is not suited - is that he tries so hard that he almost makes himself "work" in the film. I think Jane Powell would have been a good choice. Deanna Durbin was retired, but she certainly had musical talent. Turner and Lamas were also pretty hot and heavy off-screen, which added to the onscreen heat. They were set to do Latin Lovers next but apparently had a very public brawl, so Lamas was out and Ricardo Montalban was in (the movie, that is). I think Lana also benefitted by being paired with an old pro like Una Merkel, who had at least as many scenes with Lana as Lamas did. She did some comic heavy lifting and made Lana look good by association. Lana's self-awareness worked against her in comedy and she relied heavily on co-stars to help put herself across. Ernst Lubitsch's handling of this same material in 1934 was "magical". His film version is perfect and it "floats" on air. Although Jeanette McDonald and Maurice Chevalier were hardly the same kind of singer - they did work well together. She's operatic and he's popular - but, sometimes, her voice is so high that she cannot be understood well - and he, of course, has that thick French accent. But Lubitsch weaves them into a whirling mass that never stops moving. Lamas was a good singer. I read once that MGM originally signed him to be the singing voice of their already established Latin lover, Ricardo Montalban. Then they realized he was leading man material in his own right. He sings in "Dangerous When Wet", which I think is the best Ester Williams musical. It's really him singing in The Merry Widow. Yes, Williams and Lamas were a great combo. Speaking of which, I wonder if TCM has ever played the French version of the movie that was produced alongside the English one (similar to the Spanish and English Draculas also made at the time.) If they haven't, it would make a great TCM Import as I'm very interested in seeing it. There's only a few clips on YouTube though.